Nuclear power is regarded by some as a solution for addressing climate change. Proponents claim that it is a "clean" source of energy and it will reduce carbon emissions. Too expensive: Nuclear is the most expensive method to produce electricity. Not renewable and not long term: Uranium is not a renewable resource. It will effectively run out sometime before the end of this century. Nuclear is not a long term option, only a possible transitional one. According to researchers, the average grade of uranium extracted from mines has gradually declined over the past 50 years. Water: Large quantities of water are required to safely operate the plants - France halved its energy generation from nuclear in 2006 due to water shortages. Too late: If we started building nuclear power stations now, they wouldn’t be ready within 15 years, so they won’t be available in time to realise immediate emission reductions. Not economic: Wind, solar and biomass will be economically competitive with both nuclear and carbon capture and sequestration (CCS) by about 2020, after which the cost of operating both nuclear and CCS would rise. This would make them both more expensive and financially risky over the entire investment cycle. The environmental impacts of nuclear power are likely to increase as high-grade uranium becomes harder to find. 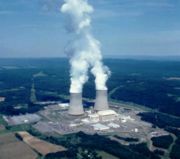 Germany has announced plans on 31 May 2011 to become the first major industrialised power to shut down all its nuclear plants, with the last to be closed by 2022. Environment Minister Norbert Roettgen announced the government's "irreversible" decision, which was prompted by the Japanese nuclear disaster. This page was last modified 23:11, 30 May 2011.